Two summers ago in an interview for a story in Gluten-Free Living about marinades, Gary Murphy told me that NASA was interested in sending his Little Soya soy sauce into space. 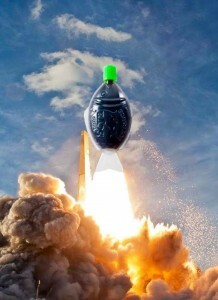 Now, the little plastic fish-shaped containers of gluten-free soy sauce are about to blast off. Today they’ll be on board a European Space Agency cargo-carrying spacecraft delivering supplies to astronauts and cosmonauts on the International Space Station. The soy sauce solves two problems faced by men and women living in space. First, their sense of taste diminishes so they need strong flavors. Second, when they open a typical plastic packet of soy sauce, or any condiment, it explodes in the zero gravity environment. Little Soya comes out in small quantities only when the fish is squeezed, making it perfect for seasoning in space. The wife of an astronaut who saw the unique re-closeable packets in her local Texas H-E-B food store alerted NASA. Murphy got the first call from the NASA Space Food Systems Laboratory in 2012 and then didn’t hear much until earlier this year when it was approved for flight. “We’ve spent the past six years honing the recipe to create the best tasting soy sauce on earth – and now in space,” says Murphy, company founder and CEO. He’s hopeful the space travel will elevate Little Soya’s place in the market. It’s happened before. Think Tang, the powdered orange drink that was heavily advertised as the astronauts’ choice after going into space in the 1960s. Little Soya was created in 2008 specifically for a buffet at Caesars Palace in Las Vegas. Murphy then started selling the soy sauce to high end sushi restaurants in his native Houston. Originally it was made with wheat, like most soy sauce, but Murphy sought out a gluten-free recipe after servers and bartenders kept telling him about customers who were asking for a gluten-free soy sauce. When he started the search for a gluten-free recipe, he did not even know what gluten was and had to do a Google search for the term. Now, his gluten-free soy sauce has earned a place in the cosmos.